You may know that WCCLS member libraries have great nonfiction reference books to help you research a topic or complete a homework assignment. But did you know that WCCLS offers access to these great reference books in e-book form? Access them anywhere, anytime, from the WCCLS website. 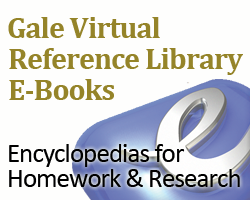 This collection of e-books is called Gale Virtual Reference Library. The books in the collection cover a wide range of subjects, from law and medicine, to history and literature. There are also lots of e-books for kids in the collection, with titles covering subjects like castles and space exploration. Find Gale Virtual Reference Library at the WCCLS website and log in with your library card handy!